A cruise ship is making its way across the Pacific Ocean on a beautiful calm tropical day. The passengers are strolling along the deck, swimming in the pool, sun baking or playing deck games. Suddenly without warning the emergency alarm sounds shattering the calm. 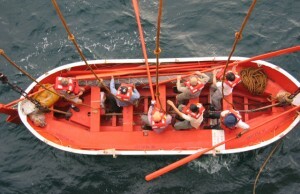 The crew hurriedly gathers the passengers on the boat deck. They are told that a fire has broken out in the engine room and the ship is in danger of sinking. They must launch the life boats. Four life boats are launched and because of the natural law of association the first life boat is quickly filled with all the pessimists’ on board. The conversation in this boat runs like this: I knew I should never have gone on a boat trip … I don’t suppose there is another ship for thousands of miles … they’ll never find us …. they say dying of thirst is very nasty … Someone has brought their guitar with them and has begun to sing nihilistic songs by Kurt Cobain and REM. No one has taken any initiative to get them organised and rowing, after all what’s the point, they are thousands of miles from any land and anyway in what direction should they row? And, as someone pointed out: Even if we found an Island, global warming and rising sea levels means that we wouldn’t last long there any way. The second life boat gathers all the hedonists. Most are still dressed in their bathers and sports gear. They have also managed to wangle a case of champagne on to the life boat and some glasses. As their boat pushes away from the sinking ship you can still hear the laughter and the chink of glasses. Some are even diving off the life boat and swimming back and forth, after all it’s a lovely day. Some one is heard to say: Hey this is so exciting … I wonder what time the boat or plane to pick us up will arrive? The third life boat has gathered all the optimists, they are already organised and rowing strongly as a team in an unwavering direction; there is no doubt in their mind that there is an Island just over the horizon. There had been a conference (junket) on deconstruction and post modern literature on the cruise for lecturers from university arts faculties. They have all gathered in the fourth life boat. Some have managed to bring their copies of Derrida and Foucault and other impenetrable books with them. Ironically they are the only boat with a chart and compass, the problem is they can’t agree on how to read them! They are engaged in a furious debate about the meaning of the arrow and the north symbol on the compass and the chart. The argument is that originally they were drawn up by men in a world dominated by patriarchy and therefore are tainted with gender bias and can not be trusted. The arrow is really a phallic symbol of male sexual dominance. In any case what is a map but one person’s perspective of the way things are. This boat is obviously not going anywhere! Meanwhile, unknown to our boats a storm is gathering just over the horizon. Each of these “boats” represents different attitudes to life and reality that anyone trying to communicate the Christian faith in a contemporary setting faces.